By Tim O'Reilly, Founder and CEO of O'Reilly Media, Inc. Fake maps claiming to correlate crime rates and Democratic votes, circulated via email. I have a brother who is a big Donald Trump fan, and he frequently sends me articles from various right-wing media sources. Last week, he sent me a variant of the image above. I immediately consulted Snopes, the fact checking site for internet hoaxes, and discovered that it was, as I expected, fake. According to Snopes, these are actually both electoral maps. 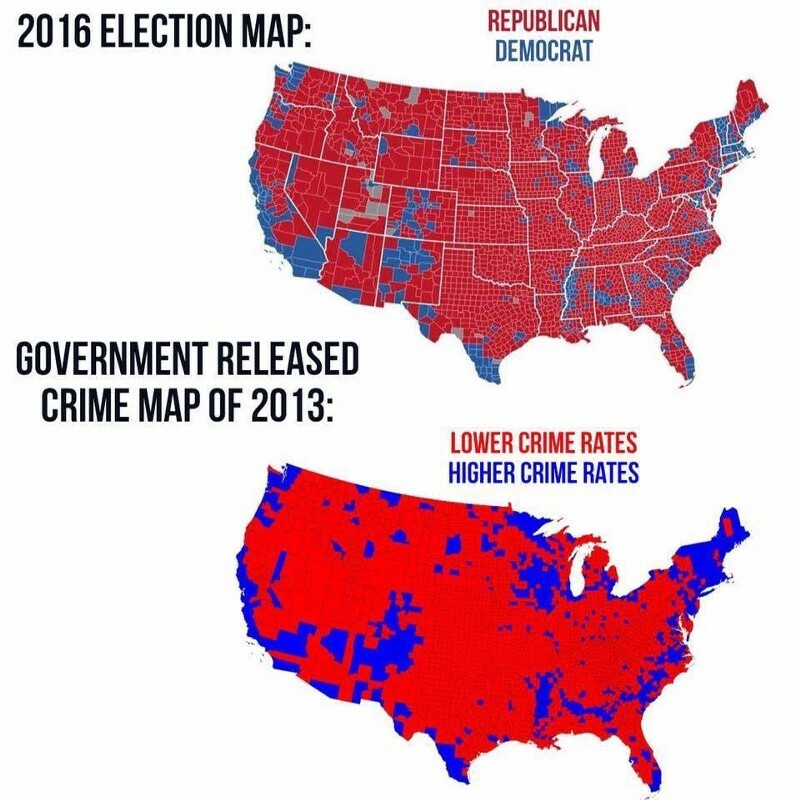 Per Snopes, “On 11 November 2016, the Facebook page “Subject Politics” published two maps purportedly comparing the results of the 2016 U.S. presidential election with the 2013 crime rate in in the U.S…. The map pictured on the bottom actually shows a 2012 electoral map that was created by Mark Newman from the Department of Physics and Center for the Study of Complex Systems at the University of Michigan.” Snopes was unable to verify the source of the first map, but concluded (presumably by comparing with known electoral maps) that it is in fact an incomplete electoral map from the 2016 election. Snopes, which uses human editors for fact checking, does a good job, but they can’t find every fake news story. Still, when a reputable fact-checking organization like Snopes or Politifact identifies a story as false, that’s a pretty good sign. And in fact, the fake news story has been taken down on Facebook, presumably in response. Facebook message that now shows for the link provided by Snopes to the original source of the hoax. Continuing my research, I used Google to search for other sources that might provide more insight on the relationship between the electoral map and crime rates. 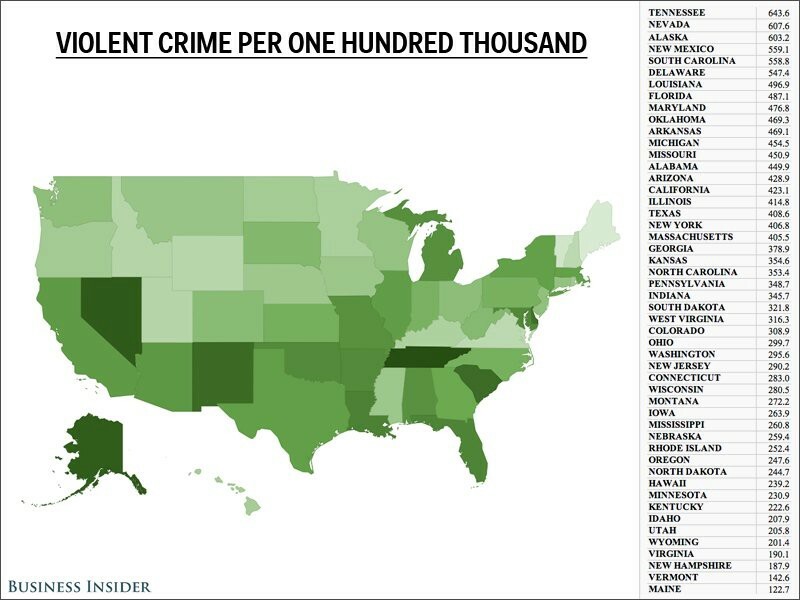 I quickly found this 2013 article from Business Insider, Nine Maps That Show How Americans Commit Crime. It shows a very different picture. Since Business Insider told me the source of the data (the FBI Uniform Crime Report) I could go verify it for myself. Sure enough, the data on the FBI site matched the Business Insider map. Do the sources, if any, substantiate the account? If there is a mismatch between the story and its sources, that is a clear signal of falsity. Last week, I wrote about an eye-opening experience with fake news. I’m no Donald Trump fan, so I was prepared to believe the headline I saw on Facebook: Mike Pence Gets ‘Booed Like Crazy’ at ‘Hamilton’. But something quickly became apparent when I watched the actual video embedded in the story: it didn’t match the description given in the article or the headline. As shown in the video, many people cheered Mike Pence as he entered the theater, and the most apparent “Boo” sounded like it was from the person holding the camera. By contrast, in the New York Times story about the same event, the description in the text closely matched the video. Many fake new stories contain jarring discrepancies between the headline and the story or between the story and its sources. Again, this is something that can be detected by a computer program (although comparing text to video may be at the outer edge of today’s capabilities.) Note that the program does not have to find absolute truth; it just has to cast a reasonable doubt, just like a human jury. Are there multiple independent accounts of the same story? This is a technique that was long used by human reporters in the days when truth was central to the news. A story, however juicy, would never be reported on the evidence of a single source. (The movie All the President’s Men,about the reporting of the Watergate scandal, made a powerful impression on me as a young man, as have many interactions with first rate reporters in stories that I myself have been involved in over the years since.) The Huffington Post’s ‘Booed Like Crazy’ was a quote from a tweet about the event. How many tweets were there from audience members reporting booing? How many reported cheering, or a mix of cheering and booing? Again, searching for multiple confirming sources is something that computers can do very well. If the story references quantitative data, does it do so in a way that is mathematically sound? For example, anyone who has even a little knowledge of statistics will recognize that showing absolute numbers of crime without reference to population density is fundamentally meaningless. Yes, there are more crimes committed by millions of people in New York City or Chicago than by hundreds in an area of rural Montana. That is why the FBI data referenced by the Business Insiderarticle, which normalized crimes per 100,000 people, was inherently more plausible to me than the fake electoral maps that set me off on this particular quest for truth. Note that when fake news is detected, there are a number of possible ways to respond. The stories can be flagged. For example, Facebook (or Gmail, since much fake news appears to be spread by email) could show an alert, similar to a security alert, that says “This story appears likely to be false. Are you sure you want to share it?” with a link to the reasons why it is suspect, or to a story that debunks it, if that is available. The stories can be given less priority, shown lower down, or less often. Google does this routinely in ranking search results. And while the idea that Facebook should do this has been more controversial, Facebook is already ranking stories, for example featuring those that drive more “engagement” over those that are more recent, and showing “more engaging” stories or stories related to ones we’ve already shared or liked. Once Facebook stopped showing stories in pure timeline order, they put themselves in the position of curating the feed algorithmically. It’s about time they added source verification and other “truth” signals to the algorithm. The stories can be suppressed entirely if certainty is extremely high. We all rely on this level of extreme prejudice every day, since it is what email providers do to filter the email we actually want to see from the billions of spam messages sent every day. As I wrote in my first article on the topic of fake news, Media in the Age of Algorithms, “The essence of algorithm design is not to eliminate all error, but to make results robust in the face of error.” Much as we stop pandemics by finding infections at their source and keeping them from finding new victims, it isn’t necessary to eliminate all fake news, but only to limit its spread. Bio: Tim O'Reilly is the founder and CEO of O'Reilly Media, Inc. His original business plan was simply "interesting work for interesting people," and that's worked out pretty well. He publishes books, runs conferences, invests in early-stage startups, urges companies to create more value than they capture, and tries to change the world by spreading and amplifying the knowledge of innovators. His current focus is on the ways that technology is transforming the economy, the nature of work, and the future shape of the business world. Tim is also a partner at early stage venture firm O'Reilly AlphaTech Ventures (OATV) and on the boards of Maker Media (which was spun out from O'Reilly Media in 2012), Code for America, PeerJ, Civis Analytics, and PopVox. Original. Reposted with permission from O'Reilly Media. Data Science and Prejudice – Blessing or Curse ?